Of all the news stories that have been written about the sad horror of the August shooting in Ferguson, MO, has there ever been a more puzzling one than the Oct. 15 front-page story in the St. Louis Post-Dispatch, headlined “Clergy-led protest raises questions over nature of repentance”? Post reporter Lillly Fowler described an event that occurred on “Moral Monday,” when “a gang of clergy” (her words) marched to the Ferguson Police Department, confronted officers, and asked them to repent. Despite the fact that demanding repentance on a public street seems inherently coercive, this seems like an ill-advised and ultimately disrespectful action. We know that many police officers in St. Louis engage in racial profiling and use excessive force, but why single out these Ferguson officers as scapegoats for our entire system of law enforcement? If the clergy want to protest and demand repentance, we can think of some organizations and individuals that engage in institutional and systemic racism that may be equally as damaging as that practiced by those who are supposed to protect and serve us. For example, why not confront those legislators in Jefferson City who have enabled an out-of-control gun culture to flourish in our inner city and small suburbs? Black-on-black crime has killed more young men for more years than any too-quick-to-pull-the-trigger police officers. Clergy of all faiths believe that idolatry is evil, and in our society guns have become idols. Doesn’t this call for repentance? While they’re in Jefferson City, our clergy could ask our legislators to repent for forcing 300,000 low-income Missourians, both black and white, to go without health insurance simply because our law-makers don’t like the Affordable Care Act that our black president was able to enact. Or maybe they would like to protest the continuing efforts to promote voter ID laws, a poll tax in disguise, which would disenfranchise thousands of voters. Change begins at the ballot box, and making it difficult or impossible for certain individuals to cast their votes is one way to ensure that the status quo remains. If they have any time left, clergy could protest the payday lenders, who snare low-income individuals into a cycle of debt that can trap them for years. Or they could demand repentance from those in the judicial system, where black men and women receive far harsher sentences than their white counterparts for the same crimes. Or they could take on the educational system, where students in poor school districts are often doomed to failure because of sub-standard facilities, a lack of supplies, and teachers who have not learned appropriate classroom management skills. Our clergy could be very busy. To be fair, many members of the clergy have gone to Jefferson City and have spoken out about issues of social injustice. They have marched, and talked, and prayed with lawmakers and others. But until the week of Oct. 13 in Ferguson, I’m not aware that anyone has called for repentance. True repentance means change, and change happens one person at a time. 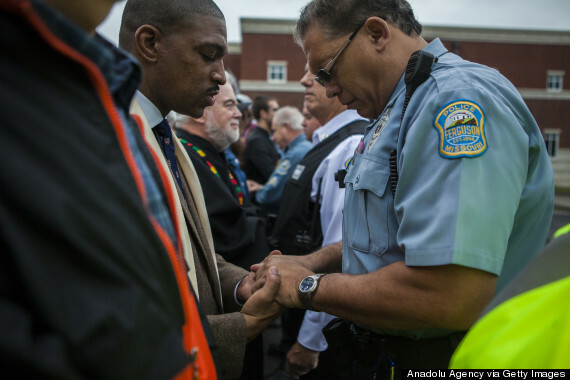 Rather than confronting and potentially embarrassing individuals when reporters and photographers are present, the clergy might have considered a more respectful way to talk to officers about their roles in the system. True repentance probably will not be a media event. Racism is an evil and it does exist in our community today. It is damaging all of us. So it is up to all of us: those who make rules, those who write legislation, those who vote, those who shop, those who donate money, those who teach, those who preach, and those who want something better for all our children—it is up to us to wake up. Now. We need to pay attention to what is going on. We don’t need scapegoats. Maybe we don’t need repentance, which is a religious construct. What we do need is to change.